David Cannon Evans may not be the first, second, or even third household name one thinks of when considering celebrated communication innovations. As it turns out, Evans was a key player in helping pioneer what came to be known as the Internet. His work is deeply rooted in Salt Lake City’s very own backyard: the University of Utah. Evans was born February 24, 1924, in Salt Lake City to David W. and Beatrice C. Evans. (Jensen, 1996) His father was the leader of an advertising firm and his family was described to have had generations of involvement in the newspaper business. (Jensen, Evans, Box 104, Folder 35) Evans married Beverley “Joy” Frewin in 1947 and together they had seven children: Anne, Peter, Gayle, Katherine, David F., Douglas, and Susan. (Jensen, Markoff) Shortly after his marriage, Evans graduated from the University of Utah in 1949 with a Bachelor of Science degree in physics. (Jensen, 1996) He later received his doctorate in the same field from the university in 1953. (Jensen, 1996) That year, Evans was hired as a senior physicist and engineering director for Bendix Corporation, where he would spend the next several years. (Evans, Box 1, Folder 2) In just a few years, Evans would engage in government work and academic research that would mark him as a significant contributor to Utah communication history. David Evans had a talent for communicating his ideas to graduate students, colleagues, and industry leaders. Special Collections Department, J. Willard Marriott Library, University of Utah. Evans joined the University of Utah as a faculty member in 1962, but he had taught previously at the University of California at Berkeley. (Markoff, Evans, Box 1, Folder 2) At Berkeley, Evans had engaged in early ARPA work but he needed support to effectively pursue his specific research interests. 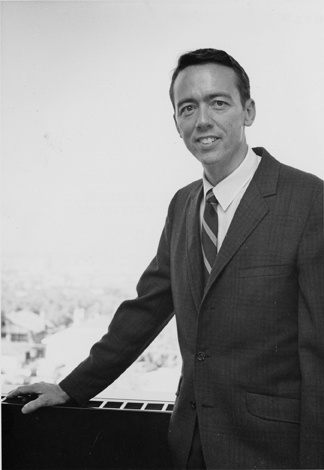 (Harvey, 2009) He was fortunate to have gained this support from Ivan Sutherland, a Harvard scholar and director of IPTO in 1964, who helped Evans gain federal funds to sustain ARPANET research. (Harvey, 2009) This was a notable feat, as it would establish a relationship and mark both men professionally as they eventually partnered to found Evans & Sutherland Computer Corporation, a private computer research business in Salt Lake City. (Harvey, 2009) Evans would go on to juggle his professional commitments as a faculty researcher and business leader throughout his career. Evans evidently impacted his students and colleagues in the world of academia but it is possible he influenced other industries outside of his field and area of expertise as well. He had captured the attention of business and communication industries outside of computer science and they wanted to speak with Evans about his work. On February 12, 1971, Evans composed a letter of advice to the operations research manager of the Minneapolis Star-Tribune in which he related certain aspects of his research in computer graphics as being useful for the automated production of a newspaper such as theirs. He explained how special computer-graphics equipment might make for a more efficient production process as well as give a person more creative control in the layout of the paper, including visuals such as advertisements. (Evans, Box 104, Folder 35) This letter, found in an unremarkable grey box within the Special Collections department of the University of Utah’s J. Willard Marriott library, could serve as evidence of Evans’ impact on communication history outside of his field. This begs the question as to whether any other industries experienced ripple effects of his ideas and knowledge, and, if so, what were they? Is it possible that ARPANET researchers could have imagined that their rapidly growing work would stretch beyond their labs to help shape a fluid platform for today’s vast Internet uses? What started out as a secured U.S. Defense project continues to morph into a public resource and medium of discourse for living in the 21st century. Although not everyone is on the Internet and its uses vary, Evans’ early notions of creative manipulation of machines reveals itself in blogs, websites, research, news, and other online communication taking place at every moment of every day. Certainly, Evans could be remembered as a man ahead of his time. It is fair to say he was a visionary, an idealist with heightened intelligence and the acquired skills of an experienced communicator. Essentially, he was an important Utah figure in Internet history who had experimented with language and communication in the form of pictures and computers — a legacy that remains relevant today. Abby M. Reyes is a senior at the University of Utah. She will complete her Bachelor of Science Honors degree in May 2015 having majored in communication studies and minored in health. David C. Evans (1969). Graphical man/machine communications: November 1969 AD708483. University of Utah, National Technical Information Service. David C. Evans papers, Ms 625, Box 1: Personal Correspondences (1969-1982); folder 2: March, 1973—April, 1974, Special Collections and Archives University of Utah, J. Willard Marriott Library, Salt Lake City, Utah. David C. Evans papers, Ms 625, Box 5: University of Utah and Speeches; folder 1-5: University of Utah, Correspondence (1967-1987), Special Collections and Archives, University of Utah, J. Willard Marriott Library, Salt Lake City, Utah. David C. Evans papers, Ms 625, Box 5: University of Utah and Speeches; folder 17-28: Speeches and Lectures (1966-1985), Special Collections and Archives, University of Utah, J. Willard Marriott Library, Salt Lake City, Utah. David C. Evans papers, Ms 625, Box 89: United States Government; folder 2: Department of Defense, Advanced Research Projects Agency, Correspondence (1970-1977), Special Collections and Archives, University of Utah, J. Willard Marriott Library, Salt Lake City, Utah. David C. Evans papers, Ms 625, Box 89: United States Government; folder 3: Department of Defense, Advanced Research Projects Agency, Proposal and Draft (1976), Special Collections and Archives, University of Utah, J. Willard Marriott Library, Salt Lake City, Utah. David C. Evans papers, Ms 625, Box 89: United States Government; folder 7-8: Department of Defense, Advanced Research Projects Agency (1969), Special Collections and Archives, University of Utah, J. Willard Marriott Library, Salt Lake City, Utah. David C. Evans papers, Ms 625, Box 104: Affiliated Companies and Customers; folder 35: Minneapolis Star-Tribune (1971), Special Collections and Archives, University of Utah, J. Willard Marriott Library, Salt Lake City, Utah. The David C. Evans Papers, P0452, Box 1, Manuscripts Division, Special Collections, University of Utah J. Willard Marriott Library, Salt Lake City, Utah. Harvey, Tom, “U. of U. helped give birth to Internet,” The Salt Lake Tribune, December 19, 2009. Hauben, Michael and R. Hauben. “Behind the Net: The Untold History of the ARPANET and Computer Science,” Chapter 7, Netizens: On the History and Impact of Usenet and the Internet (2006). Jensen, Mark. “Inventory of the David C. Evans papers, 1958-1987,” Northwest Digital Archive (NWDA) (1996). Markoff, John. “David Evans, Pioneer in Computer Graphics, Dies at 74,” The New York Times, October 12, 1998. “The ARPANET Project,” ARPANET collection, J. Willard Marriott Library, University of Utah.